The Visionary V-60 Spotting Scope features excellent BAK4 optics, high resolution coated lenses packed into a portable and durable refractor design and it comes standard with an 15-45x zoom eyepiece. This series was designed to perform well in a range of viewing situations, making it a great all-around optical instrument. You'll love it for observing nature and long distance spotting. The green metal optical tube allows for subtle observation in any nature environment. 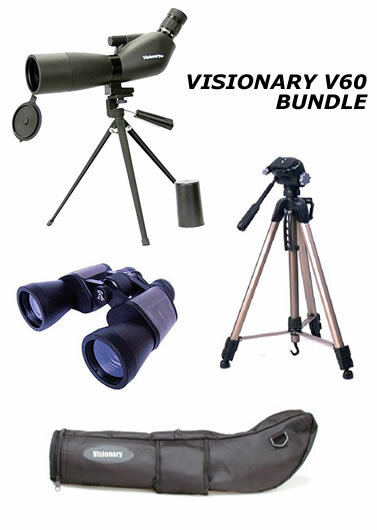 Visionary spotters are a great companion for any nature or outdoor enthusiast. Supplied with a soft carrying case. 60mm spotting scope (angled) with a 15-45x zoom eyepiece, complete with a stay on case and table top tripod, BAK4 prisms with fully coated optics, Rubber armoured waterproof body, Weight: 930 grams, Field of view at 1000m (m): 38-19 (depending on zoom setting), Field of view (degrees): 2.2-1.1 (depending on zoom setting), Minimum focus distance: 5 metre, Lens coating: multi coated, Eye relief (mm): 18-15 (depending on zoom setting), 10 year guarantee. Complete with Table Top Tripod, Soft Carry case & Stay On Case! Net Weight : 1500g  Max Operation Height: 1600mm  Min Operation Height : 620mm  Retracted Length : 640mm  Leg Diameter : 23.2mm  3-Way Panhead  Quick Release System  Separate Tilt and Pan Locks  Bubble Level  Elevator Crank and Locks  Grip Handle  3-Section Aluminum Closed Channel Legs  Side Leg Locks  Brace With Lock  Hook on Center Column  Case included. The traditional birdwatching binocular the 8x Magnification combined with the 40mm end lens produces a wide field of vision.It is a pleasure to use and gives a good quality image. 8x Magnification, Field of View is 8.2°, or 143m at 1000m, Multi-Coated lenses cut down on glare, Dimensions - Lenght: 150mm, Width: 180mm, Depth: 70mm. Includes case and straps Etc. The total RRP for this bit of kit £175, so get youself a real bargain while stocks last! !